R Markdown reports that are published with source code can be re-executed by RStudio Connect. See section 3.2.2 to learn how to publish with source code. Re-executing content can either be done manually or on a schedule. After navigating to the “Schedule” pane in the configuration window, you might see “The source code for this content was not published. The output cannot be refreshed.” If this is the case, then you will need to publish source code before it is possible to schedule your content. 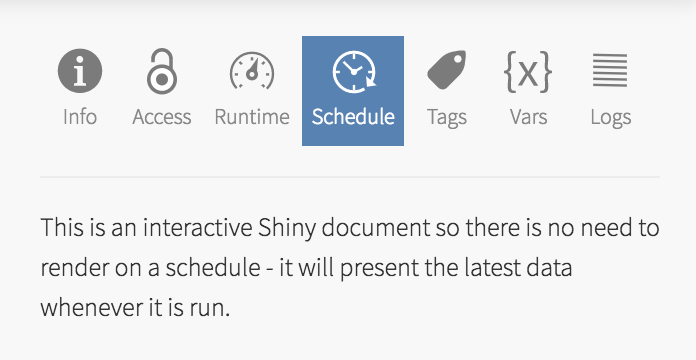 Similarly, Shiny applications or R Markdown documents with a Shiny runtime (Shiny documents) cannot be scheduled. Shiny assets show the latest data each time they are refreshed. In other cases the Schedule pane provides options to schedule your asset for execution on RStudio Connect. The start date and time defaults to the current user’s date, time, and time zone. The schedule will be built off of this date and time. Take care to keep in mind how daylight savings time (DST) might affect the actual execution time of the report. If you choose a start date and time in the past, execution will begin at the first future execution that satisfies “Schedule Type,” measured from the time that changes are saved. The schedule type and related fields will determine how frequently the R Markdown document is executed by RStudio Connect. Using the “Date and Time” above as an anchor, “Schedule Type” defines the time interval between executions. When content executes, you can decide whether or not the output should be saved and published to RStudio Connect. If you opt not to have output published after it is generated, any emails will be sent and any side-effects such as database writes will occur, but the report output will not be saved on Connect. Further, there will be no output history (See section 5.2). In order to save and publish output, as well as track the history of output on Connect, keep the “Publish Output” box checked. By default the rendered content will be attached and RStudio Connect will generate a standard subject line and email body. For more information on the ability to customize this email, see the section on email customization. If you are having difficulty sending emails, contact your RStudio Connect administrator. You can view past renders of R Markdown content in RStudio Connect using the History tool. This includes both manually triggered and scheduled execution of content (See section 5.1). This will open up a dialog to select the output bundles from previous executions of this report. The latest execution is in bold and the currently visible version of the output is highlighted. Different variants of a parameterized report will have a separate rendering history associated with them. Each collection of output is saved to disk and is available at a unique URL, along with any output files (See section 5.4). Permissions for saved output will be the same as permissions for the “parent document” and the source code that is stored on Connect. We normally think of R Markdown documents as producing a single output artifact, such as an HTML or PDF file. The rmarkdown package allows report authors to emit additional output metadata from their report. RStudio Connect takes advantage of this metadata, allowing output files, custom email subjects, and additional email attachments. There are two ways to set output metadata: in the YAML header and in R code chunks. You can also use R code to set output metadata. This is useful if you want metadata to vary based on conditions or variables within your code. Your R code can also read the current state of your output metadata. This can help you gradually alter this information as the report runs. The rmd_output_metadata names starting with rsc_ are reserved for use with RStudio Connect. Output files are files that live alongside your rendered report. They could be plots, data files, or other artifacts generated from the R code in your report. Output files will be available via HTTP, and they will be versioned in the same way as your report. Output files are also subject to the same access controls as your report. Connect will not process any output files that exist outside the working directory of the report that is rendering. That means that you cannot use absolute paths (e.g., /root/file.csv), relative paths (e.g., ../file.csv) or subdirectories (e.g., folder/file.csv). rsc_output_files takes a list of names of files that should be available after the report has rendered. If you list a file that does not exist after rendering your report, Connect will log a message but continue trying to processing the other files listed. If the output files are not generated during the rendering of your report, then you will also need to list them as resource files when you upload your report to Connect. For more information on resource files, see Section 5.5. Because output files are versioned along with the rendering of their report, they also benefit from historical views. In the example above, if you view a historical rendering of the report, when you click on the data.csv link, you will get a download of the file from the same point in time as the report. Content deployed to http://connect.mycompany.com/content/42/ will have its output files available under that URL path. An output file named daily-summary.csv will be available at the URL http://connect.mycompany.com/content/42/daily-summary.csv. 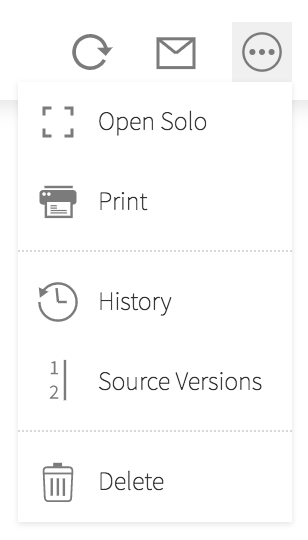 The URL for your content is the same as its “Open Solo” location and is available in the RStudio Connect dashboard. Unlike rsc_output_files, the resource_files key is not nested under rmd_output_metadata. If you do not list your resource files under resource_files, then you will need to add them manually using the “Add More…” button when deploying from the IDE. See Section 3 for more information on publishing additional resource files. You can customize the subject line used when an email of a report is generated. RStudio Connect uses the output metadata entry named rsc_email_subject as email subject. A report without an rsc_email_subject entry uses its published document name. rsc_email_subject: "My Email Subject Goes Here"
The RSC_EMAIL_SUBJECT environment variable contains the name of your published report, which also acts as the default email subject. This environment variable is helpful if you want to add, but not fully replace the subject. You can also read the current subject from the output metadata to incrementally compose a final subject. In the example above, we are specifying the file data.csv to be an output file and the files attachment_1.csv and attachment_2.csv to be email attachments. An email attachment will be accessible via HTTP just like an output file, and you can make a link to it in your report in the same way. Some mail systems have limitations on attachments in email messages. Attachments from your report need to follow the restrictions enforced by your organization. Connect is not aware of those limitations. Please work with your systems administrators / IT organization if you have trouble delivering file attachments. Scheduled reports can be configured to automatically send email after generating their output. The author of the report can suppress this option by giving the rsc_email_suppress_scheduled metadata property a logical (Boolean) value. Use the YAML header to set a default value for rsc_email_suppress_scheduled. If set to true and not altered by downstream code, the report will never permit email after scheduled execution. Any attempt to configure post-update emailing in the RStudio Connect dashboard will have no effect. You can make this decision dynamically based on data available in your report. This example assumes email is suppressed by default (as in the YAML above) but triggered when some business condition is exceeded. // email on substantial sales changes. By default, Connect adds the generated document as an attachment to email messages for that report. You can prevent this attachment from your R Markdown report by giving the rsc_email_suppress_report_attachment metadata property a logical (Boolean) value. Use the YAML header to set a default value for rsc_email_suppress_report_attachment. A true value that is not later adjusted indicates that the generated content is never to be attached to email. You can also make an “attach or not” decision in R code. Attachments configured by the rsc_email_attachments metadata property (5.6.2) are still attached and not affected by the rsc_email_suppress_report_attachment setting.